Disney WDW Pirates Of The Caribbean E-Ticket One of the pins in the E-Ticket series, this features the Pirates of the Caribbean Logo. 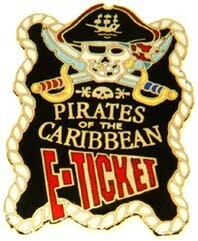 On the front it says "Pirates of the Caribbean - E-Ticket." The back says "Limited Edition 2000"